A man hater. That’s what Facebook must think I am. My “pussyhatted feminism” crossed the line, according to someone or something there at Facebook. This time a robot, AI, read what I wrote and deduced a comment of mine was hateful towards men, or maybe I wasnt being hateful enough? I dont know. All I know is that I dont hate men. 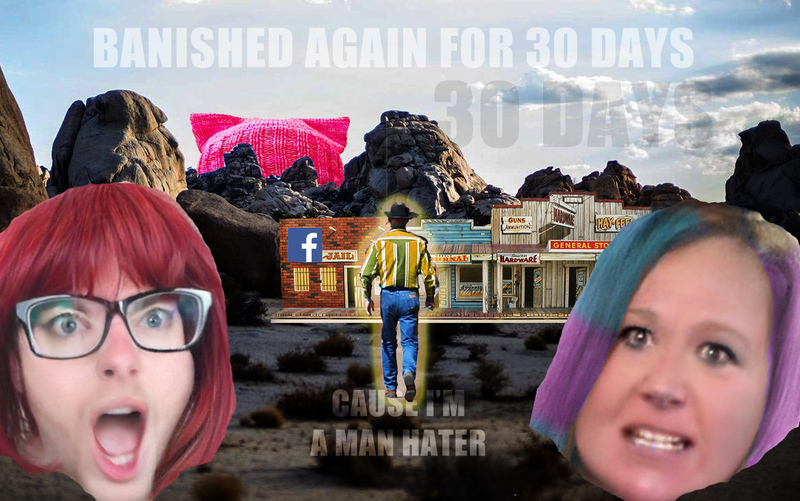 I dont own a pussyhat and I still got a 30 day ban for engaging in a cordial discussion. Or maybe they just don’t like me writing about them? Find out. Read on. Last time I got thrown in Facebook Jail it was for making a comment about a “protected group of people.” Actually, TBH (to be honest), it was one comment that intersected two “protected groups”. Even though it was a completely positive comment, just saying certain words together triggered the ban bot. Seconds later I was banned. I petitioned Facebook to reconsider it, to examine the context again, but no. I was banned for a full 30 days. This time I was engaging in a discussion about the MeToo movement. Someone had posted a meme about women being excluded in the future from mentoring and promotion opportunities on account of men being more afraid of women as a result of the movement. The discussion was taking place in a Facebook Group about personality types. Men in the discussion were talking about the importance of cameras in the workplace, and this was offending some of the women in the discussion. They were offended that it meant men were trusting women less. Some women in the discussion were very taken back at the idea of not being trusted – especially before they themselves did something untrustworthy. That discussion took place before I chimed in. she: … are all women false accusers? me: only as much as all men are p i g s.
She was arguing that cameras in the workplace are overkill because so few women would be false accusers. I responded back to her, out of a sense of fairness, agreeing with her that cameras feel like overkill. I said back to her, answering rhetorically, “only as much as all men are pigs.” I was responding back that I thought few men would sexually harass co-workers. I was agreeing that it hardly necessitated putting everyone under a lens all day. That was all I said. Next thing you know, when I return to Facebook an hour or so later I see a message that told me “something I said violated community standards”. It was the one comment I made. There was no explanation, no reasoning why my comment may have crossed the line. Of course I petitioned it, but they turned my petition down. I explained that my response was rhetorical and cordial, but to no avail. They denied my petitions. I received no parole. I’m in Facebook Jail again. I’m 10 days in. Twenty days to go. It’s nice to not chime in, just read other people’s Fake News posts without a impetus to correct them. It’s a relief. I get to finish blog posts I should have finished years ago. I don’t hate men. What was Facebook thinking? But really? What’s up with Facebook? What did they think I was saying? Did they read that as a statement where I was declaring a hate for men? Or is it the reverse? Did the robot trigger a review and then a human administrator decided I wasn’t hating men enough? They didn’t tell me. I suppose the lesson to be learned is not to speak about “protected groups” (which includes men) in the same comment or post where you mention a barnyard animal. Or maybe the lesson is to not write articles that are critical of Facebook, especially ones that reveal revenue generation methods and population measurements to be less than honest and so sloppy that they’re easily discovered by a dummy like me. I’m not going to ask you to “Catch me on Twitter” or “Connect with me on LinkedIn”. Those sites have their own issues that make them less appealing to me compared to Facebook, but at least I’m not banned on them. Instead drop me an email or connect with me on Discord where all the cool kids are hanging out. Tell me some stoopit storiez bout how you in jail bruh. Read about the first time I landed in Facebook Jail here.